4. "The postero-medial planum temporale area ... is an auditory area important in the act of articulation" p. 721. The planum temporale clearly contains auditory cortex. However, not all of the PT is auditory. The posterior 1/3 or so corresponds to cytoarchitectonic area Tpt (yellow shade in figure below). 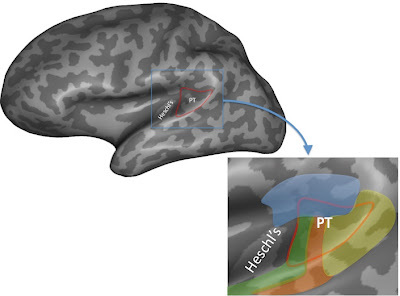 Why should we care that area Tpt is not part of auditory cortex? Because (i) it shows clearly that thinking about the planum temporale as a single functional area performing a single computational operation is misguided and (ii) it supports the view that the posterior sector of the PT is involved in something else besides auditory computations, for example, sensory(not just auditory! )-motor integration. Galaburda, A., & Sanides, F. (1980). Cytoarchitectonic organization of the human auditory cortex. Journal of Comparative Neurology, 190, 597-610. 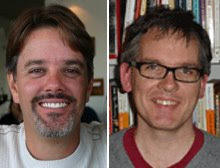 Smiley, J. F., Hackett, T. A., Ulbert, I., Karmas, G., Lakatos, P., Javitt, D. C., & Schroeder, C. E. (2007). Multisensory convergence in auditory cortex, I. Cortical connections of the caudal superior temporal plane in macaque monkeys. J Comp Neurol, 502(6), 894-923. Greg, I am with you on your call for more scrutiny on PT subdivisions. I solemnly swear to become more specific with my own PT data and claims based on it. To this end, could you kindly refer me to the paper you got this PT figure from? Did I miss this one? Best, J. That figure is my rendition of the subdivisions reported in Galaburda & Sanides 1980. Here's a link to my paper which is still in press.